[e]Scape before it's too late! That hurt my mind, maybe made 15 jumps at most, thought it was going to turn all the way around. Nice idea, does it go on forever? So punishing! Possibly the player is too close to the bottom/top of the screen to begin with. Could be good to increase the difficulty as you move through the level to allow the player time to get used to the upside down controls. 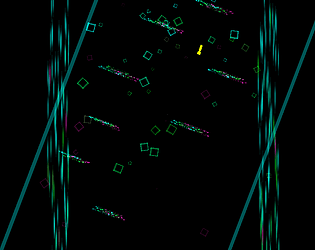 Nice use of particles to disorientate the player. It would be nice to provide an option to inverse the left/right movement controls. I keep getting mixed up.